Dozens of Israeli soldiers invaded, on Thursday at dawn, Kobar village, north of the central West Bank city of Ramallah, and demolished a home owned an imprisoned father, who was abducted with his son in December of last year, and is also the father a young man, who was killed by the army on December 12th, 2018. Media sources in Ramallah said many army jeeps surrounded the village before invading it accompanied by armored military bulldozers. 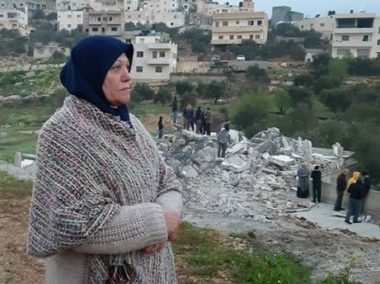 They added that the soldiers demolished the home of Omar Barghouthi, who is imprisoned by Israel, after forcing the family out, and opened fire at many Palestinian protesters. On January 20th, the soldiers invaded Kobar after surrounding it, and stormed the home of the imprisoned Omar Barghouthi, 66, the father of Saleh Barghouthi, who was assassinated by the army on December 12, 2018, and Assef Barghouthi, who was abducted by the soldiers on December 8th, 2018, along with his father. Israel also holds Omar’s imprisoned son, Assem Barghouthi, responsible got two shooting incidents, killing three soldiers, the Maan News Agency has reported. It is worth mentioning that Omar received a six-month Administrative Detention order, without charges or trial. Omar is a former political prisoner, who previously spent 26 years in Israeli prisons, including being held under arbitrary Administrative Detention orders, without charges or trial. He has several health conditions, and was recently admitted to surgery, prior to his abduction. His brother, Na’el Barghouthi, is also a political prisoner who has been held by Israel since his abduction 39 years ago.